This weekend, Marietta Main Street is hosting a Cabin Fever Bar Crawl in Downtown Marietta. On Saturday, April 13th, head downtown for tropical drink specials, a Lost Shaker of Salt Treasure Hunt, and a whole lot of Margaritaville merriment! Participating bars and restaurants will be offering specials for ticket holders from 2:00 p.m. to 6:00 p.m., with an after-party at Boathouse BBQ beginning at 6:00 p.m. featuring live music from The Steve Hussey Band if weather is nice. Ticket holders will be able to pick up their tickets beginning at 1:30 p.m. on Saturday at the Marietta Main Street office in 204 Front Street. All ticket holders will receive an event guide and wristband, a custom shot glass, exclusive discounts at participating bars, exclusive access to food specials, and an invite to the after-party. Clues for the treasure hunt are being posted on the Marietta Main Street Facebook page in the days leading up to the Bar Crawl. To be eligible to win, you must have a ticket to the Cabin Fever Bar Crawl and be 21 years of age. The final clue will be given to all participants when they pick up their tickets on Saturday – and the winner will take home the grand prize, sponsored by Weber’s Market! Participating restaurants and bars include The River Town Grill, Town House, The Galley, Over the Moon Pub & Pizza, Austyn’s Restaurant & Lounge, Gator’s, Emanuel’s Chef’s Restaurant & Bakery, and the Riverfront Bar & Grill, each offering margarita and/or pina colada specials. Threadz, which just celebrated its one year anniversary, is also participating, with an in-store sangria sip-n-shop for ticket holders. Tickets are $15 in advance, or $20 at the door on Saturday. Tickets can be purchased on the Marietta Main Street website. 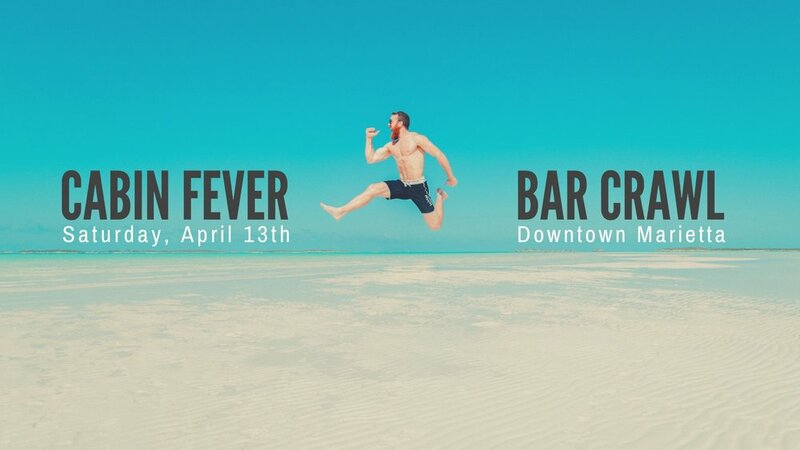 All proceeds from the Cabin Fever Bar Crawl benefit Marietta Main Street, a 501(c)3 charitable non-profit dedicated to revitalization in downtown Marietta. Marietta Main Street brings people together to preserve, enhance, and enjoy downtown Marietta.